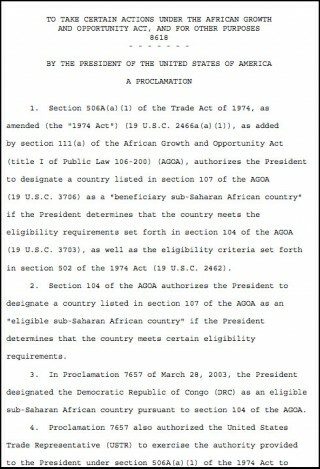 * The Democratic Republic of the Congo (DRC) is currently suspended as an AGOA beneficiary. A nation endowed with vast natural resource wealth - the DRC is slowly recovering after decades of decline. Systemic corruption since independence in 1960, combined with country-wide instability and conflict that began in the mid-90s has dramatically reduced national output and government revenue and increased external debt. 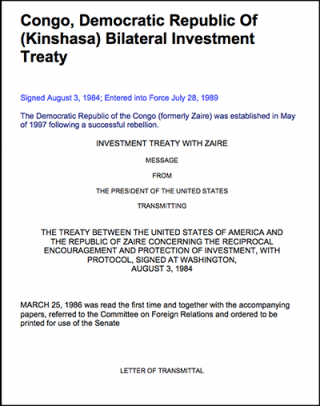 With the installation of a transitional government in 2003 after peace accords, economic conditions slowly began to improve as the transitional government reopened relations with international financial institutions and international donors, and President KABILA began implementing reforms. Progress has been slow to reach the interior of the country although clear changes are evident in Kinshasa and Lubumbashi. An uncertain legal framework, corruption, and a lack of transparency in government policy are long-term problems for the mining sector and for the economy as a whole. Renewed activity in the mining sector, the source of most export income, has boosted Kinshasa's fiscal position and GDP growth in recent years. The global recession cut economic growth in 2009 to less than half its 2008 level, but growth returned to around 7% per year in 2010-12.